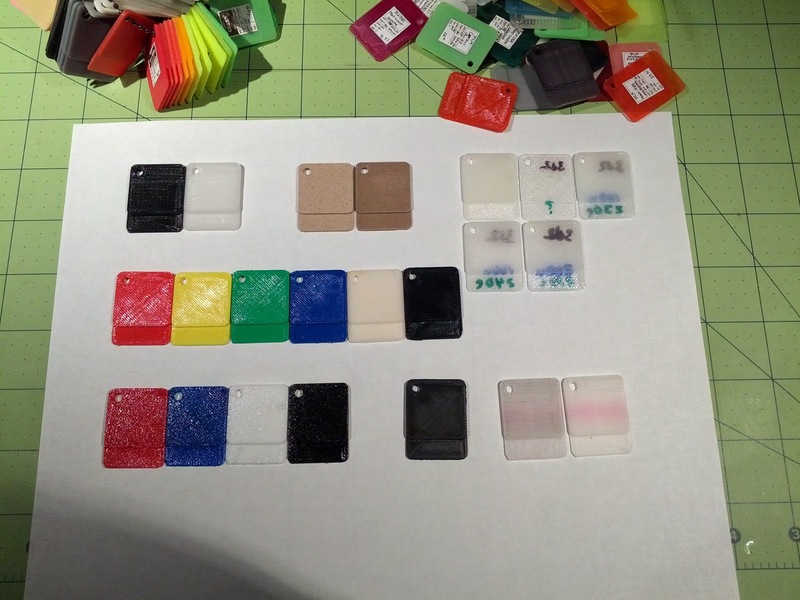 dbclunie: 3D Printing : Filaments Filaments Filaments! 3D Printing : Filaments Filaments Filaments! 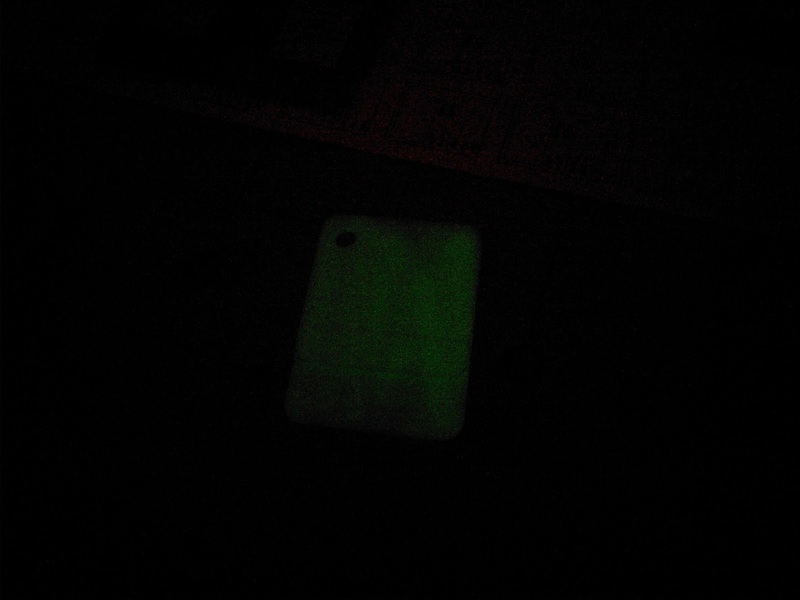 trying to show the ultra glow but phone camera is crap. So as you can see I've been getting a lot of new samples lately. 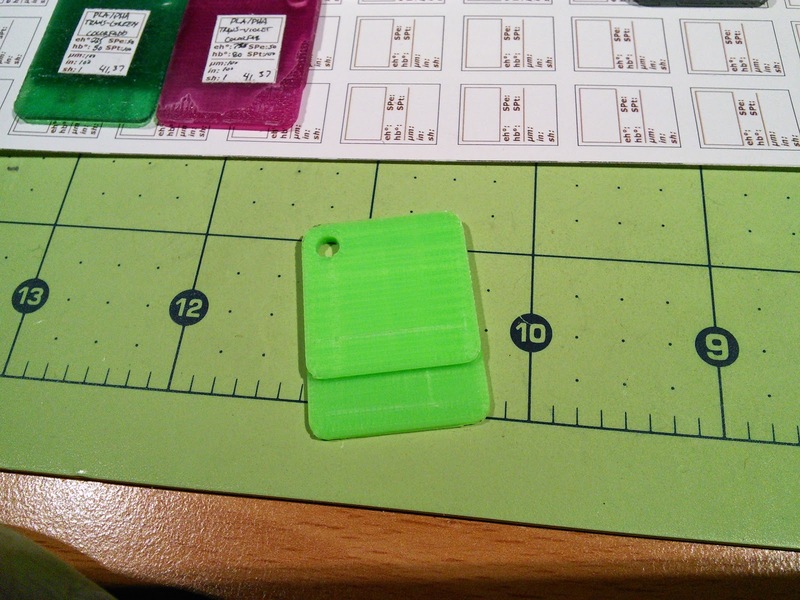 Some of my initial observations are that the EcoFlexPLA and the 3d2 print (as seen in the video above) seem to be about the same in flexibility, that is to say they are more rigid than the NinjaFlex. One flexible filament I haven't had a chance to test, as I have yet to order any, is the filaflex filaments from RECREUS.com. 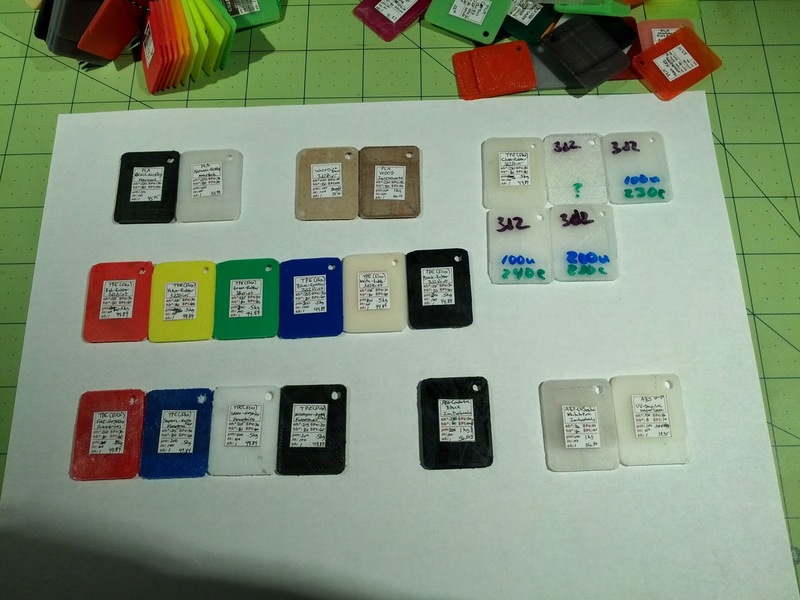 One thing to notice in the last pic are the 5 sample chips with some writing on them in sharpie, those are all the same filament! 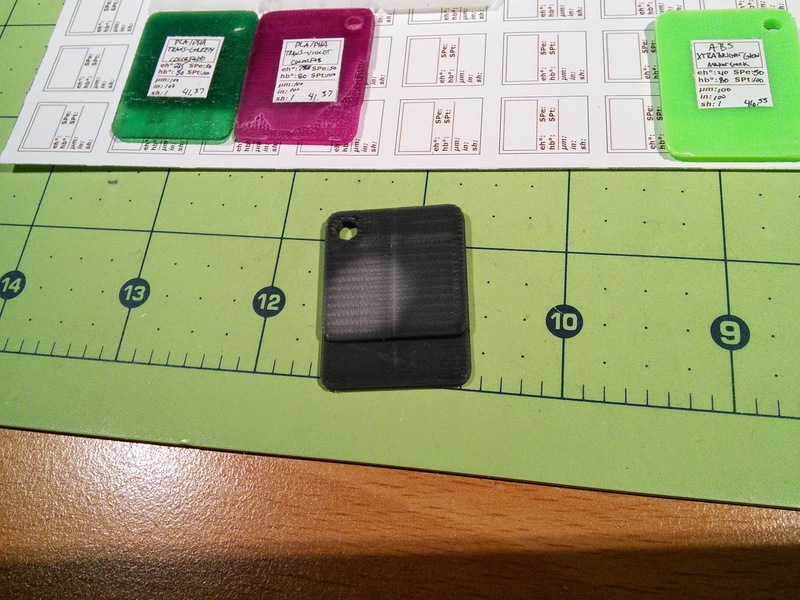 The 3d2prints clear rubber made those chips using varying temps and z resolutions. Saddly I couldn't remember or reproduce the very clear one, top row middle, but that chip actually is about only 3 layers deep and didn't finish, so that could be the reason why its so clear. The higher the temp it seems the more clear, but that could be also because I increased from 100 to 200 microns. I should try out a 300 micron layer as I would expect even more clarity. 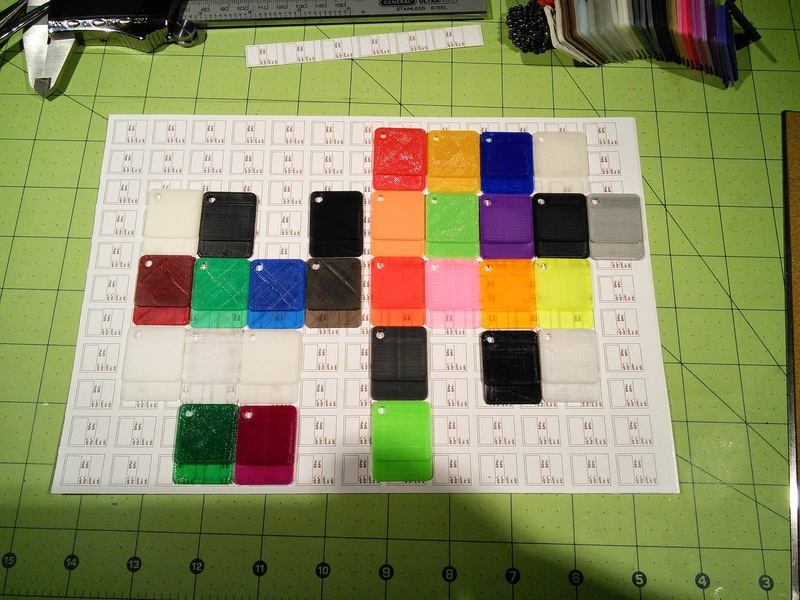 Now Ninjaflex is completely flexible, more akin to a silicone in my opinion, also comes basic colors as can be seen, but they just added new colors Sun(yellow), flamingo(hot pink), lava(orange), and water(a clearish rubber). 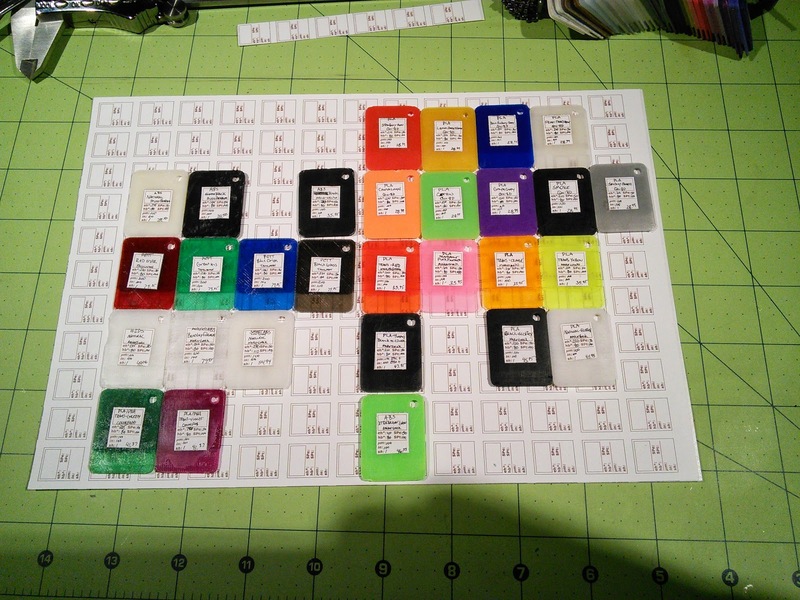 Also in the last pic you can the very last two semi clear/white chips, those are UV sensitive materials which is why they have a redish/pinkish hue going across their middles. I took my blue laser light and zapped em for a few seconds. One is from maker geeks which supply for around $20 .25kg of the material where as if you go to zen toolworks on amazon, you get 1kg for 49.99. which I think is the better deal if you want a full spool. The last chip I want to talk about is the black one on the bottom row sitting all by itself. 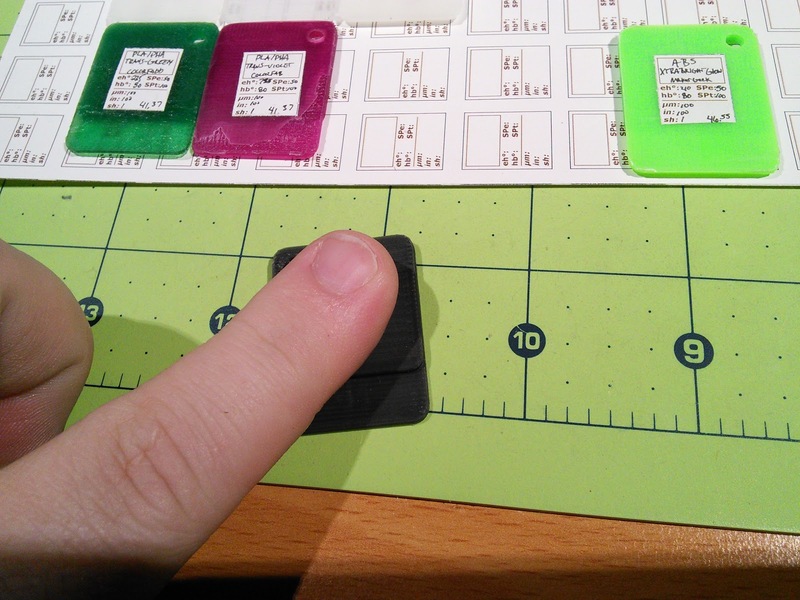 Its also from zentoolworks and its black conductive filament! Its rated at 10,000 ohms per cm and I haven't seen alot on this filament, one youtuber came up with a niffty wiper using copper tape and a design he made that changes the resistance and thus the readout on a 1 digit readout. One thing I do want to say about the conductive filament is that holy crap is that stuff is a pain to clear our of your nozzle! I imagine its because of the material they use as the chip feels like a graphite like material and seems a bit more brittle than normal ABS, but I ran some clear then red filament scraps about 5 m worth through the nozzle and there were still bits and pieces coming out, as can been seen in the first uv filament chip (which I printed right after I "thought" the nozzle was clean). My suggestion is to use a seperate head if you plan on using the conductive material alot!